Definition at line 21 of file LogDiagnosticPrinter.h. 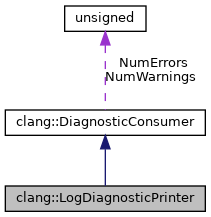 Definition at line 20 of file LogDiagnosticPrinter.cpp. Note that diagnostics may be emitted outside the processing of a source file, for example during the parsing of command line options. However, diagnostics with source range information are required to only be emitted in between BeginSourceFile() and EndSourceFile(). LangOpts The language options for the source file being processed. PP The preprocessor object being used for the source; this is optional, e.g., it may not be present when processing AST source files. Definition at line 72 of file LogDiagnosticPrinter.h. The diagnostic client should assume that any objects made available via BeginSourceFile() are inaccessible. Definition at line 76 of file LogDiagnosticPrinter.cpp. The default implementation just keeps track of the total number of warnings and errors. Definition at line 111 of file LogDiagnosticPrinter.cpp. References clang::Diagnostic::FormatDiagnostic(), clang::PresumedLoc::getColumn(), clang::SourceManager::getFileEntryForID(), clang::SourceManager::getFileID(), clang::PresumedLoc::getFilename(), clang::Diagnostic::getID(), clang::PresumedLoc::getLine(), clang::Diagnostic::getLocation(), clang::SourceManager::getMainFileID(), clang::FileEntry::getName(), clang::SourceManager::getPresumedLoc(), clang::Diagnostic::getSourceManager(), clang::DiagnosticIDs::getWarningOptionForDiag(), clang::DiagnosticConsumer::HandleDiagnostic(), clang::Diagnostic::hasSourceManager(), clang::PresumedLoc::isInvalid(), clang::FileID::isValid(), clang::FileEntry::isValid(), clang::SourceLocation::isValid(), and SM. Definition at line 68 of file LogDiagnosticPrinter.h.